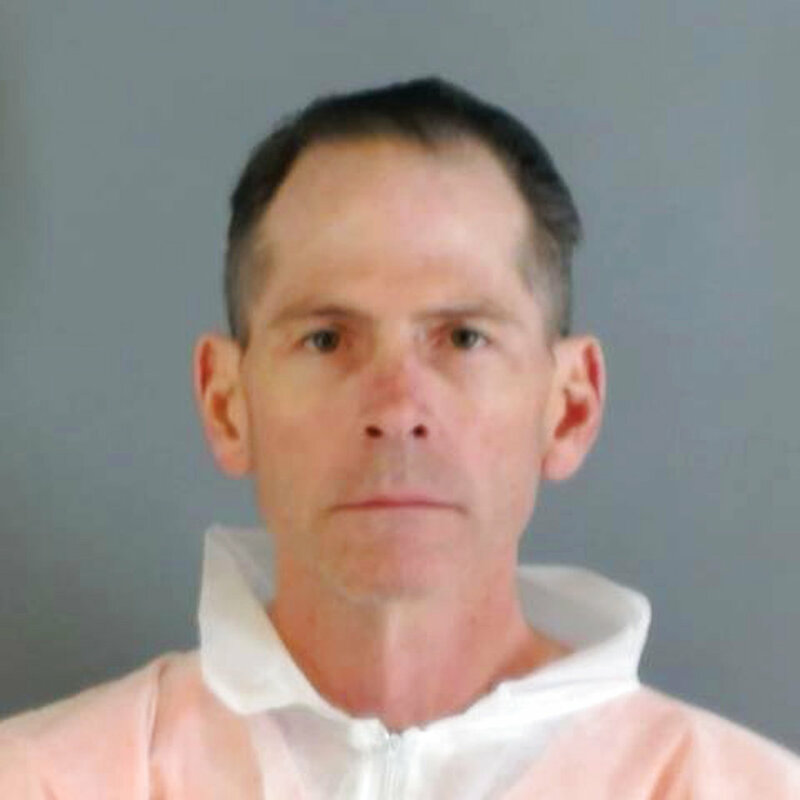 THORNTON, Colo. (AP) — A man suspected of fatally shooting two men and a woman inside a suburban Denver Walmart was arrested 14 hours later following a brief car chase Thursday that ended at a congested intersection during the morning rush hour, police said. Scott Ostrem, 47, was arrested after police pulled over his car about 5 miles (8 kilometers) from the Walmart store in the city of Thornton, police spokesman Victor Avila said. Television footage showed Ostrem, with close-cropped hair and wearing a red polo shirt, standing silently and staring down as he was handcuffed. Avila declined comment on whether Ostrem had a weapon when he was arrested. Police had yet to determine a motive for the shooting, which occurred late Wednesday inside the busy Walmart about 10 miles (16 kilometers) north of Denver in a busy shopping center. The federal Bureau of Alcohol, Tobacco, Firearms and Explosives joined local police in the investigation. Witnesses said a man walked into the store, opened fire and fled. Dozens of shoppers and employees dropped to the ground and rushed to escape as police cruisers and ambulances raced to the scene. Aaron Stephens, 44, was in the self-checkout line when he heard a single shot followed by two bursts of gunfire. Then people ran for the store’s exits. “The employees started screaming. Customers were screaming. They were running like crazy, and I ran out too because I didn’t want to get killed,” he said. Two men died inside the store, and a woman died later at a hospital, police said. Their identities were not immediately released, and it was not known if the suspect knew them. No Walmart workers were injured in the attack, said spokesman Ragan Dickens. Dickens added that there is no evidence that Ostrem ever worked for Walmart. The store remained closed Thursday, he said. Authorities identified Ostrem as a suspect after reviewing surveillance footage from the store. Avila said police went to a Thornton apartment early Thursday and did not find Ostrem there, but received an anonymous tip that he was driving a red Mitsubishi in the area and quickly spotted him. The brief chase ensued. Ostrem was taken away in a police car and the car he was driving was towed away on a flatbed truck. Avila said Ostrem had a minor criminal history but did not elaborate. Court records show a charge of resisting arrest against Ostrem in 1999 was dismissed. Records also show Ostrem filed for bankruptcy in 2015. Ostrem worked for a Denver-based roofing company as a field employee until 2014, said Sandra Runyon, an administrative assistant at Tecta America Colorado Commercial Roofing. Runyon said the company had had no contact with Ostrem since he left. She didn’t provide additional details. Residents of the apartment building where Ostrem lived in a third-floor unit described him as unfriendly and occasionally hostile. Teresa Muniz, a 54-year-old meat processor, said most tenants in the building are friendly with each other but Ostrem never returned her greetings. Several times, he swore at people for sitting in the outdoor stairways or leaving laundry in communal machines, she said. Muniz said she sometimes saw Ostrem carrying a bow and set of arrows or a shotgun into or out of his apartment. Gerald Burnett, a 63-year-old retiree who lives in a first-floor unit, said he was sitting on the stairs drinking coffee one morning when Ostrem came down the steps. Ostrem told him to move and cursed at him, Burnett said. Tags: shooting, walmart. Bookmark the permalink.